The new 8-passenger Honda Pilot has a fresh new look for 2019. With a more aggressive exterior, an available hands-free tailgate and refinements to its 9-speed automatic transmission (Touring and Elite models) the new Pilot is ready for the open road. This midsize SUV has received significant powertrain refinements and plenty of technology upgrades. 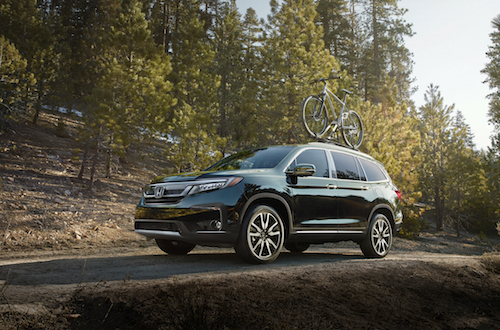 All 2019 Honda Pilot models will also have the expanded application of Honda Sensing® suite of advanced safety and driver-assistive technology features as standard equipment. 2019 Honda Pilot models are equipped with new infotainment features including 4G LTE in-car Wi-Fi, a larger Rear Entertainment System with Blu-Ray™ and streaming video capability. 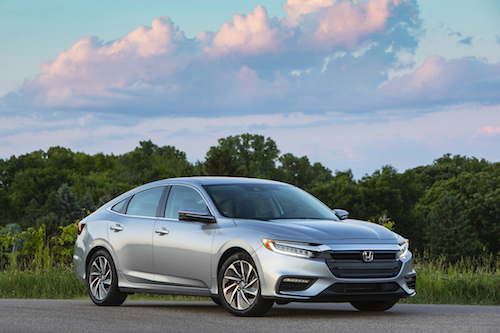 Other new features include Honda’s family-friendly CabinTalk™ in-car PA system and the new smartphone-enabled CabinControl™ app. New audio advancements for the Honda Pilot include an available Display Audio touchscreen system with a physical volume knob, and Apple CarPlay™ and Android Auto™ integration. These new upgrades further increase the capability and functionality of the Honda Pilot. Its state-of-the-art technology and family centric features have made this model one for the most popular midsize 3-row SUVs on the market. As with all Honda SUVs minivans and pickups, the Pilot is produced in North America using domestic and globally-sourced parts, with more than 60 percent in the U.S. at plants in Lincoln, Alabama, in Greensburg, Indiana and in East Liberty, Ohio. Our Honda Dealership serving Atlanta will take delivery of the new 2019 Honda Pilot soon. If you would like to learn more about this innovative new model please contact us.